This is the first music Monday of 2018, and it is a special favourite of mine! This Music Monday, Viva la Dolce is featuring Ed Sheeran's latest hit, "Perfect," featuring Andrea Bocelli. This version is actually titled, "Perfect Symphony." Although the original version was released in September 2017, the song recently received a big boost on the charts, thanks to two new releases featuring collaborations with Andrea Bocelli and Beyonce. While the original song, as well as the duet with Beyonce are equally fantastic, there is just something so enchanting about the version with Bocelli. 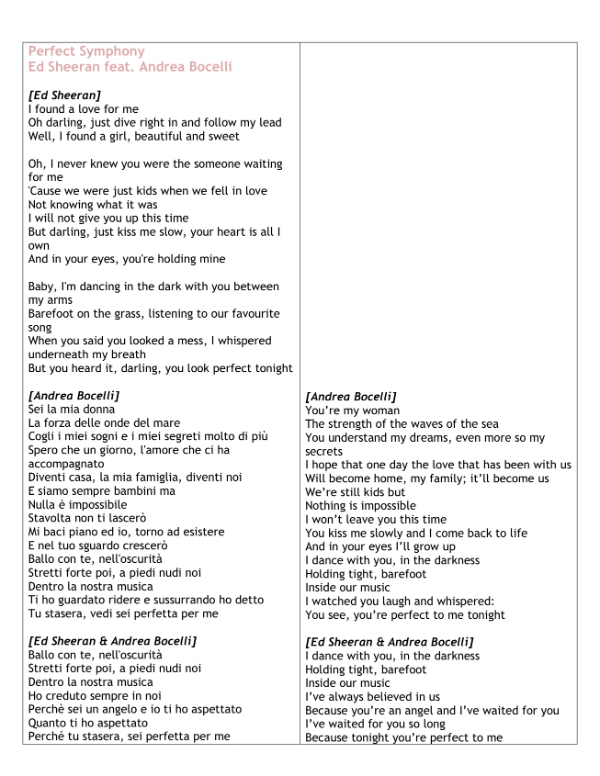 Elements such as the inclusion of the Italian language in the song, the instruments used, and hearing Sheeran sing in Italian, make this version all the more special. I equally enjoy the music video, as it offers a "behind the scene" glimpse into the recording of the song, including natural reactions to the amazing talent (note: you need to see Ed Sheeran's look of awe as Bocelli sings! It pretty much sums up how many of us feel). In addition to the music video, you will also find below translated lyrics. I've also included an additional video featuring an interview with Bocelli and Sheeran regarding their collaboration. Hope you enjoy this song as much as I do!